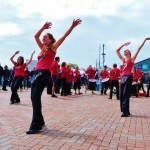 Samba Galez started in 1990, in the City Centre Youth Project in Charles Street, Cardiff. Until 2001, it was a project organised by South Wales Intercultural Community Arts (SWICA). The band was called the Cardiff School of Samba, or Samba Gales (with an S). Practice sessions took place on a Sunday afternoon at 4pm, which was a great time. The pubs shut at 3 on Sundays in those days and didn’t re-open until 7. This dead space on a Sunday was perfect for making a row, especially in the city centre where nobody could hear. At first the sessions were open to anybody who showed up. Soon though, regular players found they couldn’t progress. There were always new people trying to pick up the basics. This was the beginning of regular Saturday workshops for experienced sambistas. Access courses were organised for new members to get up to speed before joining the main band. Eventually, the band became independent of SWICA.